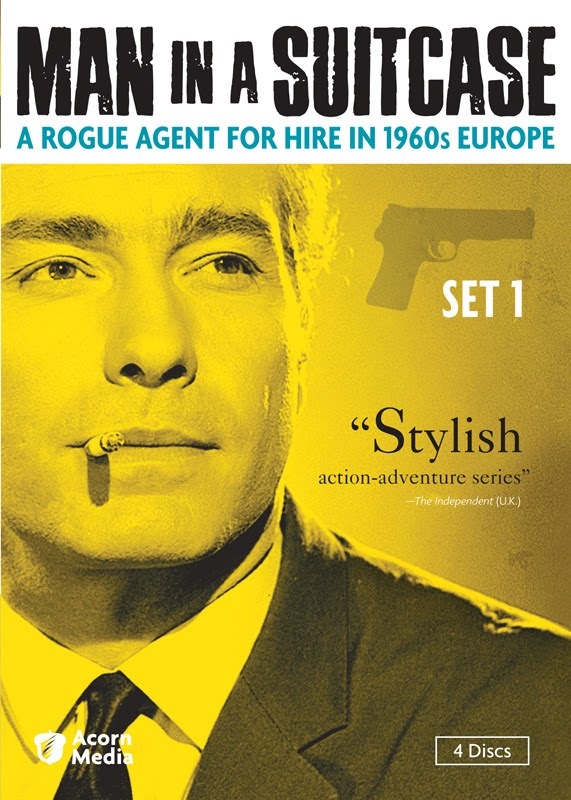 TV on DVD: "Man in a Suitcase: Set 1"
Check out this cool 60’s British spy show. Set in England during the cold war 60’s, Man in a Suitcase is one of those British imports from that era that exudes coolness, even though the plots don’t amount to much and the action is kind of limited. This snappy series involved the story of McGill, an American spy who’s been cut loose by U.S. intelligence for insubordination and possibly treason. Accused of allowing an important scientist to defect to the Soviet Union, McGill was actually trying to prevent the defection but was ordered by his superior to stand down. However, no one believes him, especially since that superior, Harry Thyssen, is dead. Unable to return to the U.S., he decides to put his spy skills to use by becoming a private investigator based in London. He has constant run-ins with British Intelligence and some of his old colleagues from America. If only he could prove his innocence, he wouldn’t have to be a man living out of a suitcase, moving from hotel to hotel while he waits his next job. Despite the heroic stature the series gives McGill, the guy has a shady past, as we learn in the first episode of the show. Kidnapped by a former South African politician forced out of the country, McGill is subjected to trippy brainwashing techniques in an attempt to get the former spy to admit to plotting an assassination. We can read in McGill’s eyes that he most definitely had something to do with the crime he’s accused of, but he’s been trained too well to admit such a thing. This early indication that McGill carried out some heinous acts makes the protagonist of Man in a Suitcase more complex than your typical action hero. Adding to that characterization is the portrayal of the character by American method actor, Richard Bradford. Bradford had few credits to his name when he was cast in the lead role. The British producers must have felt that casting an American in the lead would help sell the show to a U.S. television network. Indeed, the series aired on ABC soon after its British run. Bradford walks around each scene, hunched over as if he’s tortured, carrying a burden of guilt that he rarely reveals to the audience. With a cigarette positioned in the corner of his mouth like most people hold a toothpick, Bradford often seems to be channeling Brando (with whom he appeared in 1966’s The Chase) or James Dean. At times Bradford seems so out of sync with the rest of the conservative, English cast that some of his scenes are unintentionally funny. Yet, in my mind that’s what makes the show so cool. Bradford really seems like a man out of place, an American trapped in a foreign land. Despite being sold as an “action packed Cold War drama,” the emphasis of this series is more drama than action. There are few car chases, guns only come out sparingly. However, there is plenty of cold war intrigue and because McGill doesn’t know who to trust, every guest star seems suspicious, even if they’re a romantic interest for the beguiled hero. Fans of John LaCarre’s spy novels or The Prisoner will most certainly dig Man in a Suitcase, if they don’t already have their own copy. Acorn Media, the leading distributor of British series, have done an excellent job digitally mastering the old series. Although there are few bonus features on the fours disc set, picture quality and sound are excellent.